Certain events require a little more glam. Your V neck dress is glitzy, but it is missing that oomph. Lots of rhinestones to the rescue! The earrings have a tiny cluster that drops down into three dangling rows of rhinestones. The last rhinestone is slightly larger than the rest. 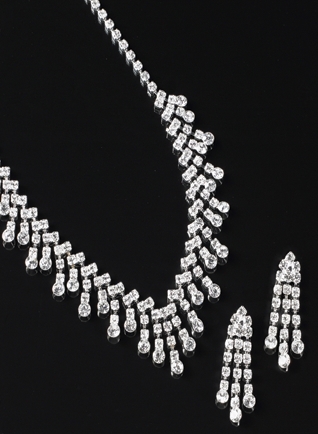 The V shaped necklace is a cascade of dangling rhinestone strips that are different lengths. They too end with a slightly larger rhinestone. FWO Extras: Set includes 16" Necklace with 2" length extender and pierced earrings.